This guide about how to grow thyme gives you step-by-step instructions about growing this popular herb. This will ensure you have a year round supply of fresh leaves for use in your recipes. There are many types you could choose. If wanting to use for cooking, the one I generally choose is common thyme. Read more about this type. Other good culinary varieties include, lemon, orange scented, silver queen and caraway thyme. 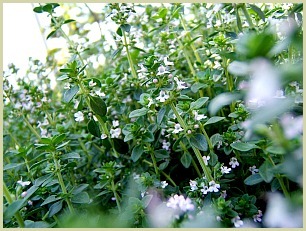 Common thyme is a perennial plant which grows to about 10-12 inches (50-60cm). It does best in well-draining, poor soil in full sunlight. You can start off indoors with seeds in early spring or sow outside after the last frosts. It is also an ideal container plant, and due to its compact size, can be happily grown on a sunny windowsill. Do not cover with compost, just water and leave to germinate in temperature between 15-20°C (60-70°F). (Keep watering to a minimum). Thinly scatter the fine seeds over the prepared bed or compost filled containers and very lightly cover with compost. Snip off a 3-4 inch piece from a non flowering growth. Remove the lowest leaves and plant in a pot. lightly water and leave ina warm place for a couple of weeks. Once it has roots you can plant out. When the plants are a few years old, you can dig them up, divide the roots and replant for new growth. Pick the young leaves all year round for use in your cooking.